Peel the onions and chop them in half, then slice thinly into half-moons. Gently cook them in a little oil on low/medium heat, stirring frequently until they are browned but not blackened - this will probably take about 20-30 minutes. Sift in 2 tablespoons of flour, stirring well to get it absorbed by the pan juices. Let it cook for about 5 minutes, then stir in the stock and cook until thickened. Pour the gravy into a jug and wash the pan out. Slice the liver into strips about 1cm (half an inch wide) and 5cm (2 inches) long. Dredge in flour. Heat some oil in the pan and cook the liver for 3-4 minutes each side. Cut the bacon into strips the same size as the liver and add it to the pan when the liver is half-cooked. Be careful not to overcook the liver as it will turn tough and unpleasant. Check for seasoning, add salt if necessary. Pour the gravy back into the pan with the meat and cook through for a few minutes. Serve with mashed potatoes and cabbage or another green vegetable. The video above is from the Keef Cooks YouTube channel. 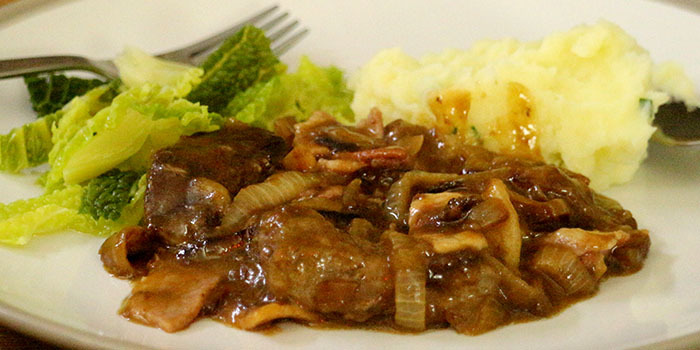 Click here to see the video recipe of Liver Bacon and Onions on YouTube.